I am new here too with an 8wk old puppy (Baxter). Looking forward to seeing pix of your new friend and of course Tilly too. Hi there and welcome to Whispers. As you have found out Shih Tzus are very good at getting right into your heart very quickly. They make brilliant companions, and I bet yours is great friends with your Daughter. If you have any problems just ask, and we will all try and help you. Also we love to see photos of your fur babies, so please show us some. We all love watching them grow up from innocent bundles of fur into gorgeous mischief makers! You will have your hands full when you pick up your new pup in a few weeks, but life will be so much fun! Good luck. You are very welcome tiasmummy. I also fell hook line and sinker for this lovely breed.I have two girls Mali & Tasha. You won't regret having two they are not as much work as people think as they won't be wanting your attention quite as much as when there was only one. What colour is tilly? do you have any photo's. Looking forward to hearing more about you little/ones. 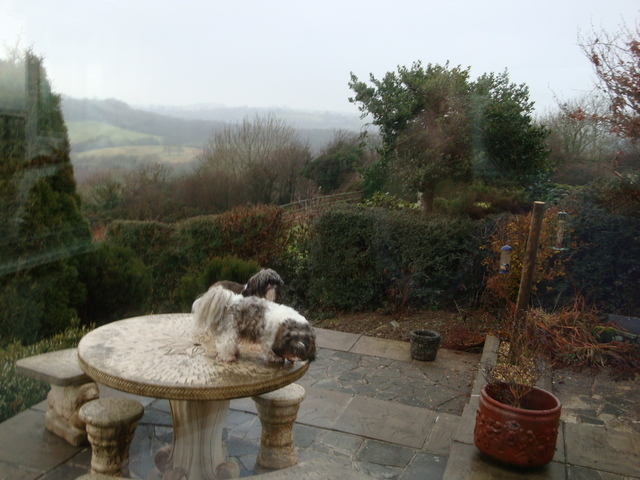 Tasha & Mali being naughty pinching the food put out for the birds.